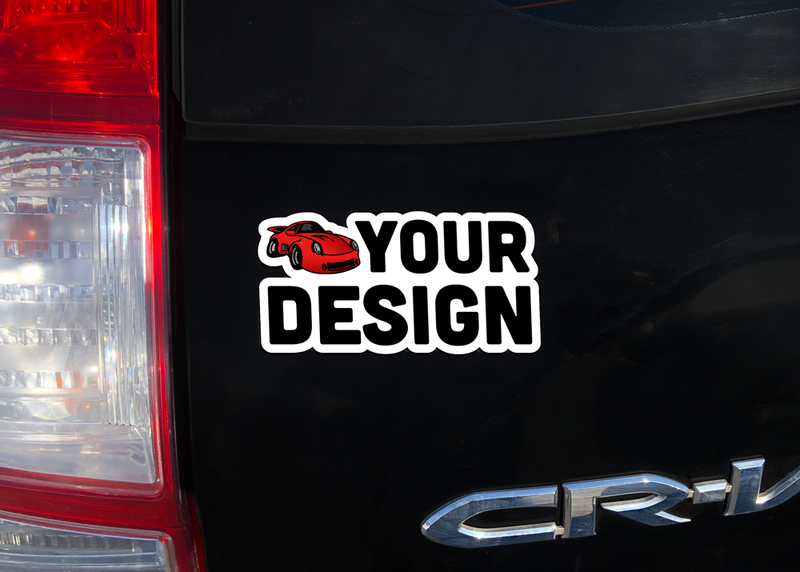 With so many different sticker materials available it can sometimes be difficult to know which one is best to fit your needs. 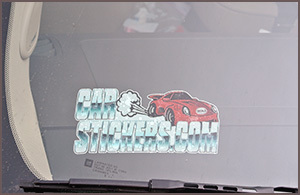 Many vehicles today have tinted windows, making it difficult to see stickers placed inside. 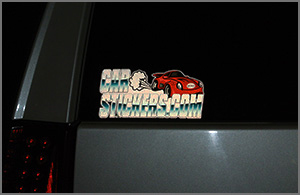 We strongly recommend outside application of stickers printed on our most popular material, White Vinyl. 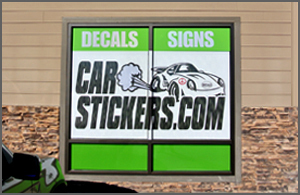 Our White Vinyl is specifically created for use with vehicles. It is weatherproof and able to withstand elements like UV rays and rain. It can be placed on almost every type of surface, including glass, metal, wood and plastic, and will not leave any adhesive residue behind once removed. 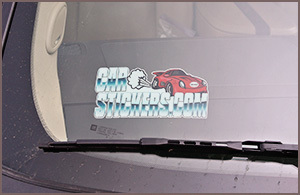 Our White Vinyl also has Air Egress technology, which minimizes wrinkles and air bubbles beneath the sticker's surface. Click on a material type below for more information to help you decide which one is best for you. If you are interested in a material we do not typically offer, please contact us via phone or email to discuss a special order. Print on clear vinyl. Outside or inside application. Lasts up to 5 years. May leave adhesive residue on surfaced when removed. Print on white cling. Low Tack adhesive. Inside window application only. Lasts up to 6 months. Print on white reflective vinyl. Outside application. Will reflect light similar to a road sign. Lasts up to 5 years. May leave some adhesive residue when removed. Print on white repositionable vinyl. This is a temporary sticker. Does not leave adhesive residue on surface. Lasts up to 6 months. Print on white vinyl. Preferred material. Does not leave adhesive residue on surface when removed. Lasts up to 5 years. 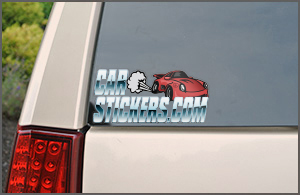 Designed specifically for car application. 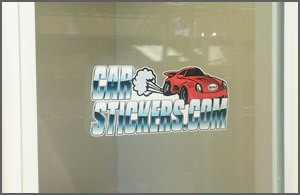 Reverse print on clear vinyl with layer of white ink behind design. Inside application. Lasts up to 5 years. May leave adhesive residue when removed. 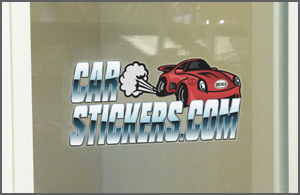 Print on permanent adhesive white vinyl. Will leave adhesive residue on surface. Select when looking to achieve a permanent sticker that you do not plan on removing. Lasts up to 5 years. Print on white vinyl applied to magnetic sheeting. Inside and outside application. Won't leave adhesive residue when removed. Lasts up to 2 years. Print on clear cling. Low Tack adhesive. Window application only. Lasts up to 6 months. Print on white cling. Low Tack adhesive. Window application only. Lasts up to 6 months. Print on perforated film. Outside application. Does not obstruct view from inside looking out. Won't leave adhesive residue when removed. Lasts up to 5 years. Print on off-white vinyl. Glows green in darkness for up to an hour. Does not leave adhesive residue when removed. Lasts up to 5 years indoors. 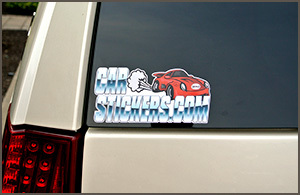 Car Door Magnet Flat surfaces made of metal Curved or plastic surfaces Lasts up to 2 years. 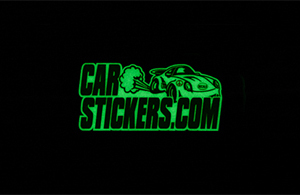 Glow in the Dark Vinyl Smooth, Flat Surfaces Nothing Last up to 5 yeas for indoor use, not intended for long-term outdoor use.